This article is a continuation of a series on financial freedom. Continue to read to learn the nine habits to help you reach your financial goals. Take a deeper dive into Exxon Mobil. Is it a stock to own at these levels? As most of my readers know, I like to write about a stock, provide a trade that I think will make money, and tie in steps to obtain financial freedom. This article follows that same style. For my thousands of readers who are following me, and hopefully implementing the money-saving tips discussed, one should have more disposable income to invest. As mentioned in my Seeking Alpha newsletter, Financial Freedom Insights, I recently provided readers a trade on Exxon Mobil (XOM). That trade has earned 36% since last week. This was not done with some wild and crazy, swing-for-the-fences strategy. Rather, it was by using a method to corner gains while controlling risk through a combination of buying and selling options - more on this below. Which Stocks Might Be Part of a Retirement Portfolio? There is a lot to be said for building a portfolio of stocks for the long haul. As you get older, your time horizon is reduced and would tend that one should allocate more to lower beta stocks and 'safer' investments that pay dividends. One such stock is reviewed in this article - Exxon Mobil; let's jump into the review. Exxon Mobil has rebounded nicely off December lows and is currently yielding 4%. Along with a return which handsomely outpaces an S&P index fund, when you buy into XOM, you are getting the assurance of 36 consecutive years of annual dividend increases. I believe their dividend will be increased in the next quarter as a further incentive to owning the stock. The future is bright for XOM. US crude just hit a five-month high, setting at $64.40 a barrel due to tensions in Libya. Upward crude prices have also been seen as stockpiles at Cushing, Oklahoma, fell by approximately 419,000 barrels last week. In addition, OPEC and allies such as Russia continue to hold firm to promises to withhold around 1.2 million barrels per day of supply. In my opinion, Saudi Arabia will continue to push for these cuts as it needs higher crude prices to balance their county's books. It is not clear that Russia will continue to comply and miss out on increased production and the revenue that comes with it. If promises are broken, we could see weakness in the crude market. In addition, if the world economies get scared into believing a recession is on the horizon, we could see new weakness. However, I suspect that any recession fears will play out dramatically and quickly. While the news mentioned above is important, the real news is what is happening in the company. As their progress outlined below continues, it is very likely that we will see a higher share price in the future. XOM continued to expertly drive performance in exploration and development plans. Upstream and downstream business continued to see success in 4Q18. Chemicals saw weakness primarily due to the lower margins in the polyolefins (e.g. polypropylene and polyethylene) market. To the end user, these are very useful plastics/polymers. In 2018, XOM added 1.3 billion oil-equivalent barrels which included additions from new discoveries and strategic acquisitions primarily in Guyana and Brazil. Of course, projections are just that - projections. However, XOM adjusted its growth plans and expects annual earnings to increase by more than 140% percent by 2025 from 2017 adjusted earnings (this assumes an oil price of $60 per barrel and 2017 margins). XOM expects annual cash flow from operations to reach $60 billion in 2025 and cumulative cash flow from operations and asset sales over the period from 2019 to 2025 to be $24 billion higher than what was previously communicated, including $15 billion from anticipated asset sales from 2019 to 2021. The company expects to double its return on capital employed (ROCE) by 2025 under the $60 per barrel price scenario. ROCE is a financial ratio that determines a company's profitability and the efficiency at which the capital is used. Exxon has embarked on a large capital spending program, and, as mentioned above, expects to more than double earnings by 2025. As such, XOM's ROCE is starting to accelerate faster than most of its peers. This is key as this was one of the major issues facing XOM over the last several years. XOM has made it clear that they want to be an industry leader again, especially when it comes to ROCE. Technically, XOM is strong. Its RSI is above 50. The MACD is positive and above its signal line; the configuration is positive. Exxon Mobil is trading above both its 20 and 50 period moving averages at $80.37 and $79.98, respectively. XOM has turning bullish and has a support at $80.30. XOM is part of the Energy Select Sector SPDR ETF (XLE) which has rallied higher and has also turned bullish. 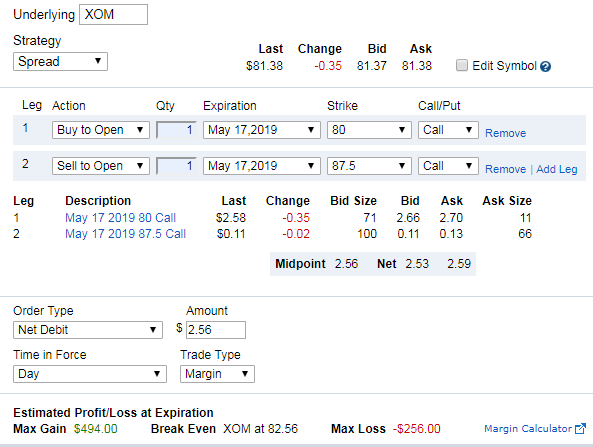 While owning XOM outright as described above might be a solid strategy with a 4% yield, there is money to be made in options. As many of you know, I love option trades like shown below - simple spreads, base hits, with max gains and losses known upon entering a trade. The trade provided to my Seeking Alpha newsletter subscribers last week along with the maximum gain and loss as well as the breakeven is shown below. At Focus on Freedoms, financial freedom is one of our main goals that we teach. Financial freedom is closely aligned to health and the ability to volunteer and travel. In general, financial freedom means having enough savings in the form of investments and cash to live a life that we want rather than making life decisions solely based on money. Many times, decisions based only on money is a detriment to our families as well as our physical and spiritual health. All too often, we are burdened with debt due to living beyond our means by not delaying purchases, not knowing the difference between wants and needs. Sometimes financial emergencies can rock even the best plan. However, the following habits (as well as many others) should be able to mitigate the risk of not obtaining financial freedom. Making a monthly budget and, most importantly, living on it is the key and the foundation of financial freedom. This will help ensure that bills are paid on a timely basis and, if referenced, will help you defer purchases that you cannot afford per your budget. Credit cards are a convenient tool and a great way to spend in a controlled environment. However, they can be very dangerous to staying on budget and can destroy your wealth building efforts. Pay off credit card balances each month with no exceptions. Remember, if you do not pay off your balances each month, you might be paying 22% or higher in interest. That’s not a great strategy. Investing is key to growing your nest egg. Of course, the use of compounding can grow your money over time – the earlier you start the better. The more time you have the easier it is to reach your retirement goals – starting to save for retirement at 25 is better than starting at 45, for example. Get a brokerage account, understand at least the basics of stocks, bonds and money market accounts. Understand your risk profile – knowing how tolerant you are to volatility in your growing investment portfolio will provide great insight into the types of investment vehicles you might want to be invested in. Essentially, this is to pay yourself first. The best way that I know how to do this is to enroll in your employer's retirement plan and make sure you at least get all the matching contribution benefit from your company. There are some tax complexities to this, but in general, try and max out the contribution limits in your company’s 401(k), 403(b), IRAs, and Roth IRAs. You can also set up an automatic withdrawal from your salary and automatically build your nest egg at an investment firm. The key is money is going out to investments before you get your hands on it. Coupled with a budget, and you might find that you can put a lot of money away. Your credit score is important as it determines what rate you will be given when you get a loan such as for a house or a car, as well as other related transactions. Also, in the days of identity theft, it’s important to keep an eye on your credit report to ensure that there are no new credit accounts being opened in your name. Of course, I am an advocate to not have any debt at all and believe that individuals should work to being debt free if possible. As you live on a budget, you might find that you are not saving as much as you want. This should lend itself to a discussion that maybe you are living beyond your means. This is the second key item. Do you really need to eat out four times a week, do you need that new car, can I skip a daily coffee? These are all small changes that can make a big difference in obtaining your saving goals. While seemingly unpopular in the media, living below your means – spending less than you make – is a key factor to keeping financial stress low and to meeting your financial goals. Making small adjustments between needs and wants are key to creating good habits. In many parts of the world, negotiation is a key part of most transactions. However, in the USA, most people do not take this tool with them into transactions. I’m not saying that you should try this at Walmart; however, you might be able to negotiate in many service areas. You might find that small businesses are more open to getting your business and especially your repeat business and will provide discounts. With the cost of healthcare seemingly to know no upper boundaries, it is key to take care of your health. Not smoking and keeping your weight at an ideal range is very important to keeping you healthy and avoiding the risk of so many maladies. Back before mobile devices and the internet, if one was going to use coupons, it required keeping a book full of little pieces of paper, monitoring when they expired, etc. Today, the use of coupons is so easy. For example, if you go to eat at a restaurant, you might be able to use their internet to access their site. Once there, you can generally find a discount that you can use for dining right then. There are also many ways to get reductions in cost by looking at online advertising for the vendors you frequent. Exxon Mobil has rebounded nicely off December lows and is currently yielding 4%. 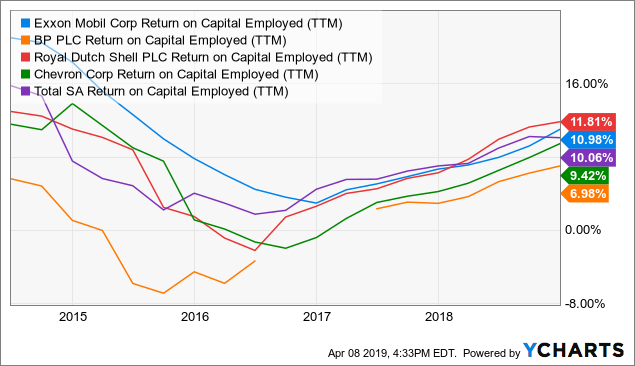 Along with a return which handsomely outpaces an S&P index fund, when you buy into XOM, you are getting the assurance of 36 consecutive years of annual dividend increases. For me, XOM is a buy. Financial freedom is closely aligned to health and the ability to volunteer and travel. In general, financial freedom means having enough savings in the form of investments and cash to live a life that we want rather than making life decisions solely based on money. The habits mentioned above should help you mitigate the risk of not obtaining financial freedom. Why You Should Join Financial Freedom Insights? In addition to analysis like you just read, we provide valuable advice related to investing strategies including stocks, stock options, and bonds. In addition, you will glean key information for those planning for, nearing, or in retirement. Invest and trade alongside a seasoned investor and learn vital information related to saving and investing as well as asset allocation strategies to help you gain additional returns in your portfolio. Simply: Save more now, invest smarter, and hopefully have more in retirement. Disclosure: I am/we are long XOM. I wrote this article myself, and it expresses my own opinions. I am not receiving compensation for it (other than from Seeking Alpha). I have no business relationship with any company whose stock is mentioned in this article.